Now a simple and quick preparation with the leftover plantain peels.I prepared this new (atleast to me) side dish last week and we all loved the crunchy peppery flavour of it.Thanks to my loving sister for the recipe. Cook the plantain pieces adding salt and little water until it is done.I cooked it in microwave for 5 mts.Now heat oil in a pan,add the cooked peels and saute it for a while.Mix in crushed pepper and fry it in medium heat until dry and crispy.Serve hot with rice. 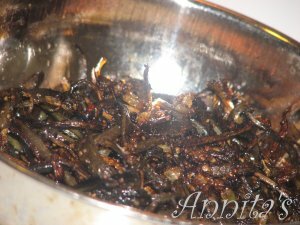 This entry was posted on November 27, 2006 at 6:01 pm	and is filed under Traditional Kerala Dishes, Veg Dishes. You can follow any responses to this entry through the RSS 2.0 feed. You can leave a response, or trackback from your own site. 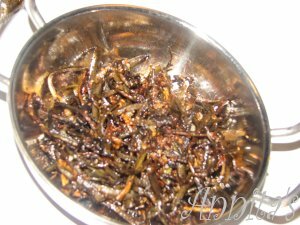 Dish is ofcourse very easy to make but, what is “Plantain Peels” and where do you get it from? These are just the peels of plantain,Nidhi..Plantains are available in all grocery stores,You have to cut the peels out of it. As far as I know, every part of the plantain tree is useul, but I never knew even the vaazhakka peel also can be used for cooking. thanks for sharing the recipe. please tell me what can the trees be used for? I’m regular visitor.Excellent collection of receipe.Especially all cakes varieties. Vaazhakka Tholi really something new,but after seeing the item in picture,i feel it should be fine.Becoz if it is cripsy we people sure will like it. in our home my amma used to make mezhukkupuratty with cherupayar and plantain peel. it is very tasty. Thats very good Annita. Tell me do you chips from the plantain fruit. I want to make banana chips at home. And would like to know how. First time hearing that you can use the plaintain peels for food. I repent for wasting the peels so long.Must try this. Annita, this is a new recipe for me. Never could have thought that plaintain peels are eaten too. wow!!! Thanks for sharing it annita. BTB; thanksgiving okke engane undayrunnu? Thanks dear…Thanks giving was boring..Didn’t do nothing much other than shopping…:)) What about urs? Plantain peel can be eaten too? This is SO cool! Next time I get plantains, I’ll give this recipe a go. What an great idea! Thanks Shammi..Try it and lemme know if u liked it or not..
What? With the peels? really? From where do you guys come up with all these? I have never ever heard about it. This is great. Now I dont have to throw them away. Wont it have kara? came across the kaayatholi only now. it was a staple at our home during onam season. the reason, the large scale frying of varuthupperi would leave behing heaps of kayatholi, which would be stacked away into the fridge neatly. muthira (horsegram) was a common combo with this high fibre peel. likewise, the root portion of the bananas also was used to make upperis. no part of the banana plant was wasted, really ! Ooh…root portion can also be used in cooking(u mean that black end)? ?…Wow…really cool…. We have lots of plantain in our area and nobody cares about the peels! I still cant believe it can be eaten. I’ll try it out men, if it works I’ll be a genus in my hood! 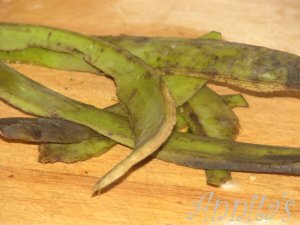 I have been eating plantain peel since I was vary young. My grandmother was vary poor when she first came to New York and nothing was wasted. Maybe I’ll leave a recipe next time I log in… Joe . can’t we add cubes and probably crayfish to make it taste better? although I haven’t tried this.